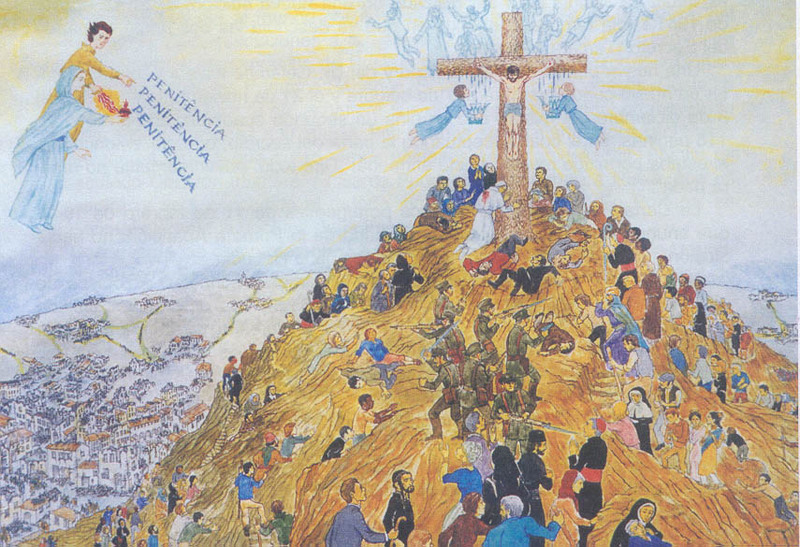 The Three Secrets of Fátima consist of a series of apocalyptic visions and prophecies which were given to three young Portuguese shepherds, Lúcia Santos and her cousins Jacinta and Francisco Marto, by a Marian apparition, starting on May 13, 1917. The three children were visited by the Virgin Mary six times between May and October 1917. The apparition is now popularly known as Our Lady of Fátima. 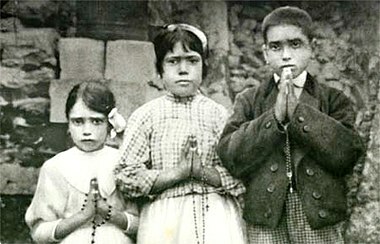 According to Lúcia, on July 13, 1917, around noon, the Virgin Mary entrusted the children with three secrets. 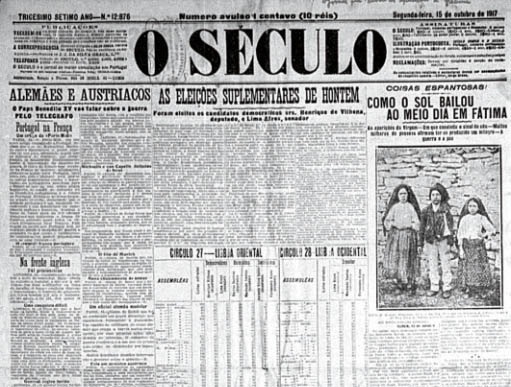 Two of the secrets were revealed in 1941 in a document written by Lúcia, at the request of José Alves Correia da Silva, Bishop of Leiria, to assist with the publication of a new edition of a book on Jacinta. When asked by the Bishop in 1943 to reveal the third secret, Lúcia struggled for a short period, being "not yet convinced that God had clearly authorized her to act." However, in October 1943 the Bishop ordered her to put it in writing. Lúcia then wrote the secret down and sealed it in an envelope not to be opened until 1960, when "it will appear clearer." The text of the third secret was officially released by Pope John Paul II in 2000, although some claim that it was not the entire secret revealed by Lúcia, despite repeated assertions from the Vatican to the contrary. In her third memoir, written in 1941, Lúcia said that the first secret, a vision of Hell, was disclosed to the children on July 13, 1917. 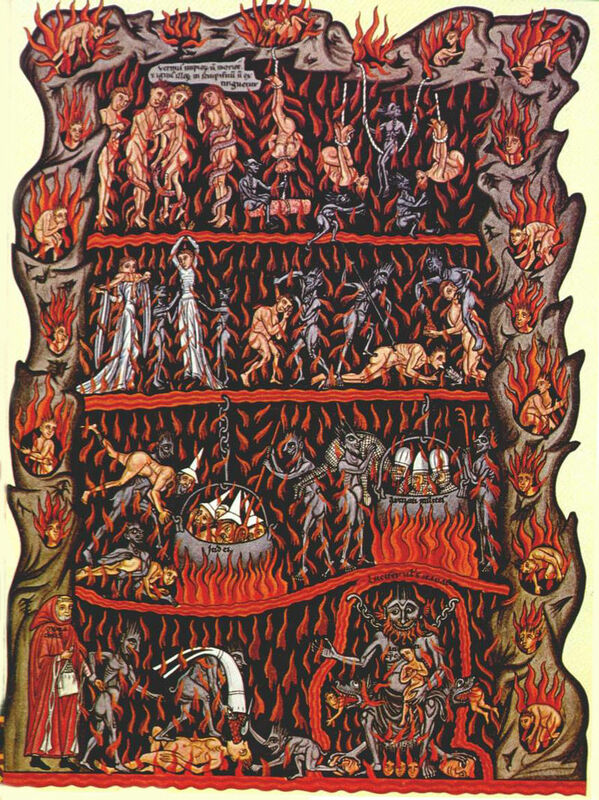 « Our Lady showed us a great sea of fire which seemed to be under the earth. Plunged in this fire were demons and souls in human form, like transparent burning embers, all blackened or burnished bronze, floating about in the conflagration, now raised into the air by the flames that issued from within themselves together with great clouds of smoke, now falling back on every side like sparks in a huge fire, without weight or equilibrium, and amid shrieks and groans of pain and despair, which horrified us and made us tremble with fear. The demons could be distinguished by their terrifying and repulsive likeness to frightful and unknown animals, all black and transparent. The second secret was a statement that World War I would end, along with a prediction of another war during the reign of Pope Pius XI, should men continue offending God and should Russia not convert. The second half requests that Russia be consecrated to the Immaculate Heart of Mary. « You have seen hell where the souls of poor sinners go. To save them, God wishes to establish in the world devotion to my Immaculate Heart. If what I say to you is done, many souls will be saved and there will be peace. The war is going to end: but if people do not cease offending God, a worse one will break out during the Pontificate of Pope Pius XI. To prevent this, I shall come to ask for the Consecration of Russia to my Immaculate Heart, and the Communion of reparation on the First Saturdays. If my requests are heeded, Russia will be converted, and there will be peace; if not, she will spread her errors throughout the world, causing wars and persecutions of the Church. The good will be martyred; the Holy Father will have much to suffer; various nations will be annihilated. Sister Lucia chose not to disclose the third secret in her memoir of August 1941. In 1943, Lucia fell seriously ill with influenza and pleurisy. Bishop Silva, visiting her on 15 September 1943, suggested that she write the third secret down to ensure that it would be recorded in the event of her death. Lucia was hesitant to do so, however. At the time she received the secret, she had heard Mary say not to reveal it, but because Carmelite obedience requires that orders from superiors be regarded as coming directly from God, she was in a quandary as to whose orders took precedence. Finally, in mid-October, Bishop Silva sent her a letter containing a direct order to record the secret, and Lucia obeyed. The third part of the secret was written down "by order of His Excellency the Bishop of Leiria and the Most Holy Mother" on January 3, 1944. In June 1944, the sealed envelope containing the third secret was delivered to Silva, where it stayed until 1957, when it was finally delivered to Rome. 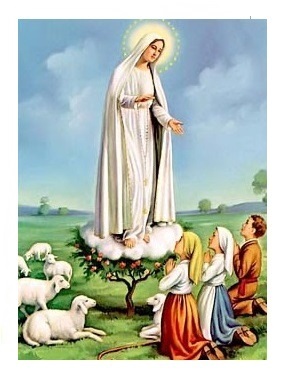 It was announced by Cardinal Angelo Sodano on May 13, 2000, 83 years after the first apparition of the Lady to the children in the Cova da Iria, that the Third Secret would finally be released. In his announcement, Cardinal Sodano implied that the secret was about the 20th century persecution of Christians that culminated in the failed Pope John Paul II assassination attempt on May 13, 1981, the 64th anniversary of the first apparition of the Lady at Fátima. « I write in obedience to you, my God, who command me to do so through his Excellency the Bishop of Leiria and through your Most Holy Mother and mine. After the two parts which I have already explained, at the left of Our Lady and a little above, we saw an Angel with a flaming sword in his left hand; flashing, it gave out flames that looked as though they would set the world on fire; but they died out in contact with the splendour that Our Lady radiated towards him from her right hand: pointing to the earth with his right hand, the Angel cried out in a loud voice: "Penance, Penance, Penance!". And we saw in an immense light that is God: "something similar to how people appear in a mirror when they pass in front of it" a Bishop dressed in White "we had the impression that it was the Holy Father". 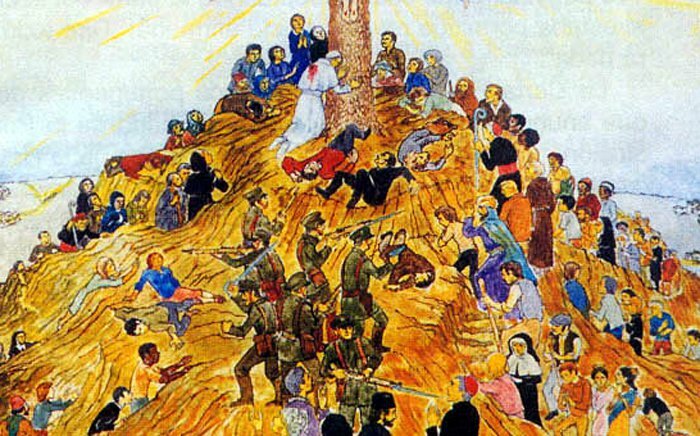 Other Bishops, Priests, men and women Religious going up a steep mountain, at the top of which there was a big Cross of rough-hewn trunks as of a cork-tree with the bark; before reaching there the Holy Father passed through a big city half in ruins and half trembling with halting step, afflicted with pain and sorrow, he prayed for the souls of the corpses he met on his way; having reached the top of the mountain, on his knees at the foot of the big Cross he was killed by a group of soldiers who fired bullets and arrows at him, and in the same way there died one after another the other Bishops, Priests, men and women Religious, and various lay people of different ranks and positions. 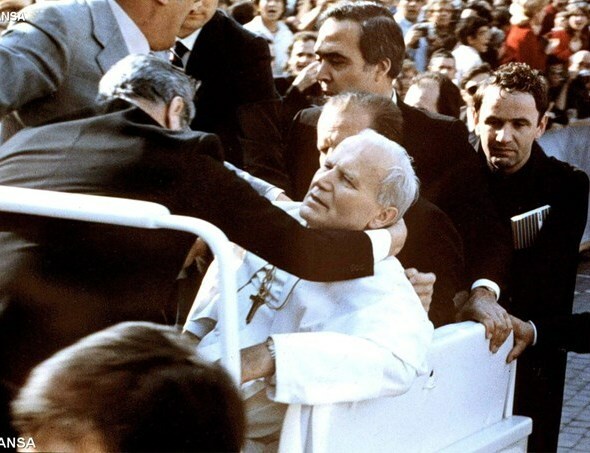 The first attempted assassination of Pope John Paul II took place on Wednesday, 13 May 1981, in St. Peter's Square at Vatican City. The Pope was shot and wounded by Mehmet Ali Agca while he was entering the square. The Pope was struck four times, and suffered severe blood loss. Agca was apprehended immediately, and later sentenced to life in prison by an Italian court. The Pope later forgave Agca for the assassination attempt. 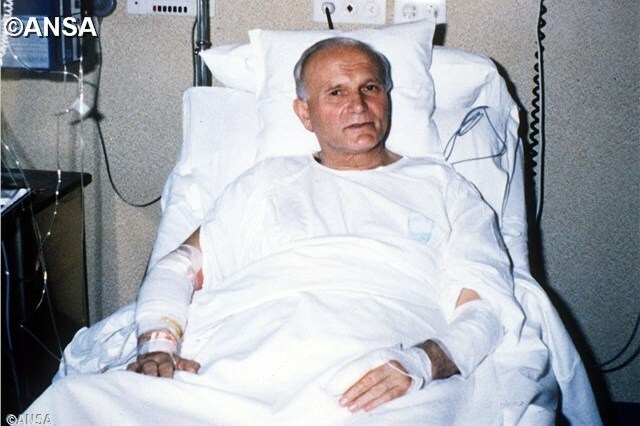 He was pardoned by Italian president Carlo Azeglio Ciampi at the Pope's request and was deported to Turkey in June 2000. Perhaps not so strange to the Pope, the day he was shot was also the anniversary of a day that would become one of the most important in the 20th century—the beginning of the apparitions of Our Lady at Fatima, Portugal in 1917. He aptly requests the full and authentic texts of the “secret” for his study. John Paul firmly believed Our Lady of Fatima saved his life, a reminder of how the Fatima devotion and the physical safety of the pope have long been intertwined. A year after the first assassination attempt, John Paul II visited Fatima to give thanks to the Virgin for preserving his life. The day before the anniversary of that attack, on May 12th, 1982, a Spaniard broke through a security line at Mass with a bayonet and successfully stabbed the pontiff before being subdued by security. No real damage was done: He continued on with the celebration as if nothing had happened, with his wound bandaged and concealed. A short time later, the Pope considered that it was the moment to consecrate Russia in good and due form. On 25 March 1984 Pope John Paul II consecrated Russia and the world in a public ceremony at St. Peter's in Rome; the consecration was in the form of a 'whole-world consecration' that included the participation of the Catholic bishops throughout the world. Cardinal Bertone said to the press many times that the message of Fátima was finished. Cardinal Bertone reported that Lúcia dos Santos had said that the consecration requested by the Virgin Mary had been fulfilled and accepted in Heaven, and that everyone should live out the consecration personally by faithfully wearing the brown scapular. "From the road, one could see the immense multitude turn toward the sun. The little shepherds arrived a half and hour befor expected. The little girls, crowned with flowers, are carried to their places. Lucia orders them to close their umbrellas. The order is immediately obeyed. There are many people on whose dry lips prayer has become paralyzed. The visible sign announced before is ready to be produced. The vast multitude turn towards the sun, which is free of clouds. The sun spun about itself like a ring of fireworks...That which they were all looking for - the sign from Heaven has been enough to satisfy them and make them convinced of their faith." 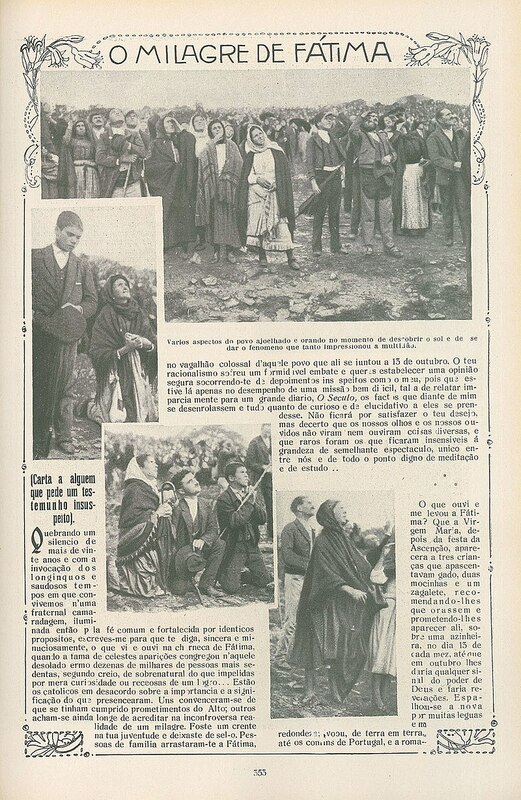 The Miracle of the Sun was an event which occurred on 13 October 1917, attended by a large crowd who had gathered near Fátima, Portugal in response to a prophecy made by three shepherd children that the Virgin Mary, referred to as Our Lady of Fatima, would appear and perform miracles on that date. 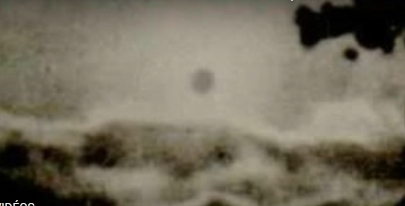 Newspapers published testimony from reporters and other people who claimed to have witnessed extraordinary solar activity, such as the sun appearing to "dance" or zig-zag in the sky, careen towards the earth, or emit multicolored light and radiant colors. 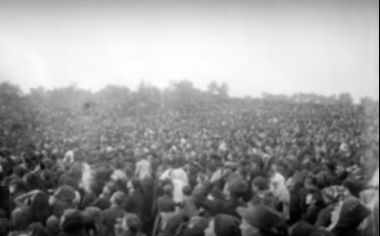 The whole event took about 10 minutes, and this Miracle of the Sun, as it became known, is one of the best-known events at Fátima. Ilustração Portuguesa N.º 610, 29 de septiembre de 1917, page 353, (online at hemerotecadigital.cm-lisboa.pt), Dominio público. - Religionenlibertad.com - El milagro del sol.